Advanced tickets are only $10!!!! There’s a special HAPPY HOUR starting at 6pm so you can get good and primed. And it’ll be over in time for you to still get your Saturday night swerve on. I’ve booked possibly the biggest and best line up I’ve ever had to ensure we start things off with a bang! What’s that Public Enemy? You don’t believe the hype? Alright fine. Here are a few small bits about each of these all stars! Scott Thompson – Yes that Scott Thompson! Kids in The Hall, Colbert Report. The Larry Sanders Show. Hannibal. Mark Little You might have seen him on the fantastic CBC show Mr. D. Maybe you caught one of his viral videos with his sketch group Picnicface? Oh and he was voted Halifax’s Best Comic four years running. Also, he taped FOUR Just For Laughs gala appearances AND won both the Just for Laughs Homegrown Competition AND the Yuk Yuk’s Great Canadian Laugh Off…in the same year! Ai Sha Alfa – Is a previous winner of Winnipeg’s Funniest Person With a Day Job. If you watch the TV or stream on the interweb you might have seen her on MTV, Much Music or as a panelist on The Strombo Show. She’s also currently at work on a web series with the hugely talented Nile Seguin. Nile Seguin (That works out nicely) Has been a writer on the award winning This Hour has 22 minutes and a writer/performer on a show formerly called The Hour. As a comedian he’s done the big time thing at JFL, San Francisco Sketchfest, Boston Comedy Festival etc. K. Trevor Wilson has appeared in on TV and Film in projects like Billable Hours and Score: A Hockey Musical. As a comedian he’s killed it at JFL (where he stow the show at the Andy Samberg Gala), the Winnipeg Comedy Festival and more. Sara Hennessey – Has she done JFL? You bet. JFL 42? Big time! JFL 44? No. That’s not a thing. Manage your expectations people. Jeez. Anwyay, she was the 2013 Canadian Comedy Award Winner for Best Female Stand Up and she’s just been stepping it up for 2 years since then. Oh and she’s been a Writer on Spun Out and Sunnyside. Ron Sparks – Let’s see..Comedy Now special, staple of Video on Trial, MULTIPLE Canadian Comedy Awards. A multitude of writing credits. I don’t need to tell you about Ron, he’s been on my show like 12 times. Sandra Battaglini – As an actress she most recently appeared in David Cronenberg’s Maps to the Stars. He made “The Fly” people. THE FLY!!! Oh and she’s a writer and Canadian Comedy Award winning Comedian. Whether doing character work or stand up she’s always on point! Alex Nussbaum – CTV’s Comedy Now? Check. CBC’s Just For Laughs? You bet. Now Magazine’s Best Comedy Show of the year? Yes. Patron’s Pick at Toronto Fringe for his one man show, Handbook to the Future? That too. 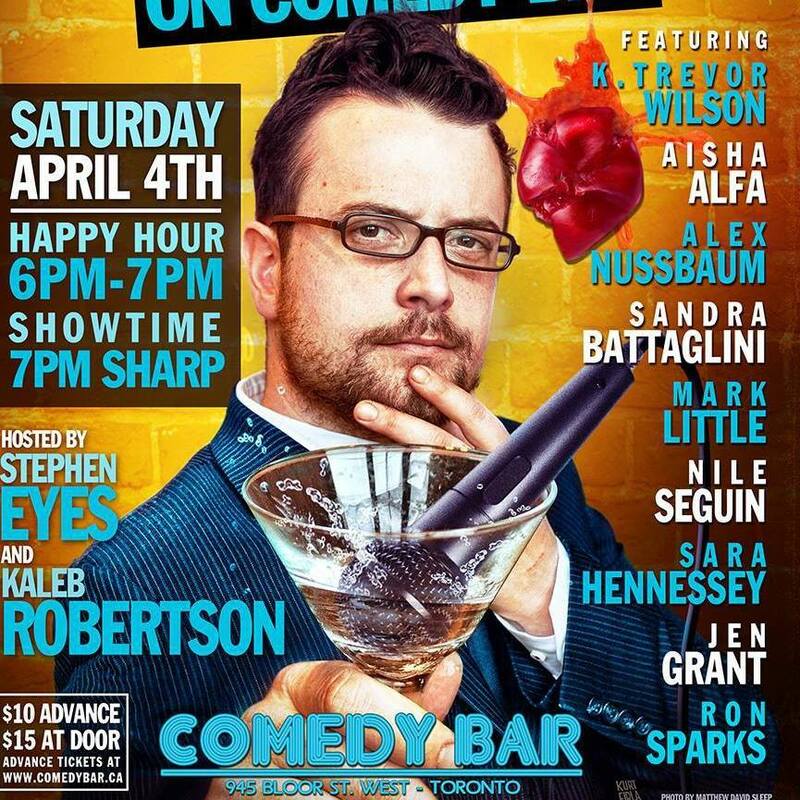 Canadian Comedy Award for Best Male Stand Up? No. But he was nominated and that’s the real honour. Also he’s been busy living it up in LA. Catch him here before he heads back.